Cohesion and excellence are concepts often expressed in threes: The three musketeers. The Three Tenors. The three wise men. The Triple Crown. The three Olympic medals. The Grossmont-Cuyamaca Community College District has a winning trio of its own — the winners of the 2018 Chancellor/Classified Senate Award — who were lauded Tuesday night by the governing board in recognition of their exemplary work. The jobs of the winners — Rochelle Weiser from Grossmont College; Gwen Nix from Cuyamaca College; and Gabriella Avila-Garcia from district services — are varied, representing the broad expanse of tasks performed by non-instructional staff. In recognition of classifieds’ critical role, one member of each college and district services is chosen each year for the honor and presented with a trophy, $250 gift certificate, recognition at the statewide Classified Leadership Conference and lunch with Chancellor Cindy L. Miles and the governing board president. Ariane Ahmadian, Cuyamaca College Classified Senate president, said the yearly award honors classified employees whose job excellence and work ethic inspire others. “Among our many dedicated classified professionals are people like this year’s winners, who go well beyond the scope of their duties and are consummate and respected members of our district,” she said. After 12 years at Cuyamaca College, with the last eight as administrative assistant to the vice president of student services, Gwen Nix is known for her institutional knowledge and problem-solving skills. The current vice president, Jessica Robinson, said she came to rely on Nix’s knowledge and sage advice when she began at Cuyamaca College in January. “The professional demeanor, coupled with her enthusiastic and welcoming personality make her a perfect fit as the welcoming face of the vice president of student services office,” said Robinson, who nominated Nix for the award. Robinson also noted Nix’s involvement in many college committees and events, including the annual Spring Garden and Butterfly Festival, the twice-year convocations and Cuyamaca’s recent 40th anniversary celebration. Her humor and warmth, as well as her professionalism, will be missed by all when she retires next year, Robinson said. Nix worked for 20 years as an administrative assistant at San Diego State University, where she earned her bachelor’s degree in social sciences. After getting her master of arts degree in theological studies from Bethel Seminary in San Diego, Nix served a three-year stint as an adjunct instructor for a freshman first-year program at SDSU. When the program ended, Nix decided to leave academia and worked for 1 1/2 years as a resort manager. “But I missed the college environment and was very happy to begin working at Cuyamaca College,” said the San Joaquin Valley native. While looking forward to retirement and leisurely touring the country in her travel trailer, she said she will miss her co-workers and the college that has been a second home over the years. 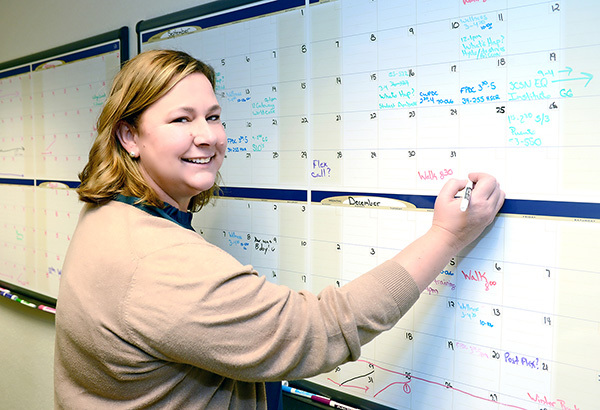 As the training assistant in Grossmont College’s professional development office, Weiser helps colleagues — faculty, staff and administrators — improve themselves through workshops and trainings. Weiser’s days are a mind-boggling jumble of handling phone calls, scheduling trainings and determining what professional learning opportunities should be offered. It’s a job Weiser has held since 2012, and she is so valued a worker that three administrators — her supervisor and the current and past professional development coordinators — nominated her for the award recognizing classified professionals. Weiser, who first started working at Grossmont College in 2009, takes pride in expanding professional development opportunities, especially for classified staff who are relatively new to the professional development picture. “It’s ongoing work, but we’re beginning to get to a place where more and more classified staff see themselves as participating as professionals — it’s been a culture shift and a journey for us,” Weiser said. Before Weiser arrived at Grossmont College, she worked for eight years for a family-operated pool service business. Prior to that, she worked for more than 20 years as a horse trainer, traveling the country coaching riders to local, state and national championships. The highlight of that career was seeing one of her riders win the American Paint Horse Association World Championship Show. Asked what she likes best about her current job, Weiser said she enjoys the people she works with and the creative prospects she is afforded. 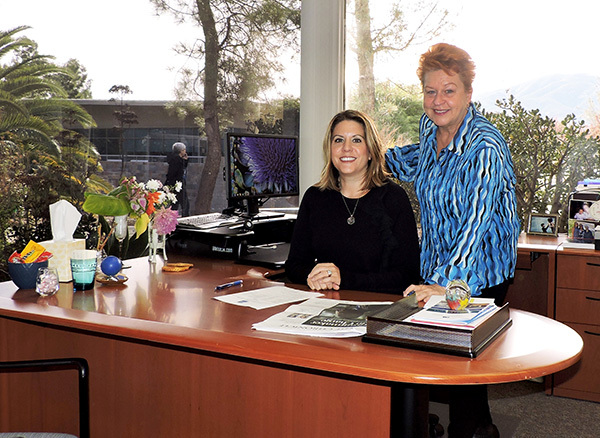 A new venture Weiser has undertaken is pursuing a child development degree at Grossmont College. On target to graduate in fall 2020, she is looking at the bachelor’s degree completion program offered through Point Loma Nazarene University and hopes one day to work in the child development field. Rarely a day passes that Campus and Parking Services (CAPS) Operations Assistant Gabriella “Gaby” Avila-Garcia doesn’t think of the phone call she received at her Chicago home in 2017 from CAPS Director Nicole Conklin telling her she had a job waiting for her. “I wanted to jump up and down with excitement because the dream I shared with my wife of moving to California was about to become a reality,” said Avila-Garcia, who grew up in Chicago. Before the college district, she last worked for 10 years as an office manager for a realty company in Naperville, a Chicago suburb, but never far from her mind was the thought of trading Chicago’s bitter cold winters for life in sunny California. When Avila-Garcia learned of the job opening at CAPS, she quickly assembled her resume and applied for the position. Avila-Garcia said the move was the best decision she ever made. “I am truly blessed to be surrounded by amazing people who have made a huge impact in my life and who I admire and look up to,” she said. Conklin said Avila-Garcia’s work ethic and willingness to perform well beyond her assigned duties make her an invaluable member of the CAPS team. Her cheery nature helps when the occasional irate person comes into the office challenging a parking ticket. Avila-Garcia is also credited for taking it upon herself to audit several invoices to CAPS and finding more than $30,000 of incorrect charges. —Della Elliott is public information specialist for the Grossmont-Cuyamaca Community College District.